This weekend was such a blessing. It set me up for a good attitude Monday…even with the sleep deprivation factor. That factor is just life. I was joking with my daughter that I’d look so much younger if the past 6 years hadn’t happened. I’d be less stressed and more rested…but alas, the wrinkles are here to stay and the sleep deprivation for a little longer too I suspect. I’ve always been a big picture person…and lately I’ve been focusing on long term life planning. Where do I want to be? Where am I heading? But today everything seemed much closer. Where do I want to live when my house sells? What do I want to do this summer? Will I be able to write more someday? Another book? What is my ideal job? Am I already in it? I can ponder questions with the best them…it’s the answers that are problematic. Today I had all kinds of ideas, but really no definitive leading. I have been praying for days…Lord, just show me. I used to say that I’d just like a lightning bolt with a memo attached…and maybe some updates along the way. Just some posted notes with status reports. Just a basic outline of the plan…where am I going to end up…where do I need to look…what do I need to do…??? Honestly, sometimes I don’t even think I need to know the why…just what to do. But I’m learning to trust that answers don’t mean everything…they are certainly nice to have, but I think I’m finally understanding that trust doesn’t always mean answers. Sometimes trust just means taking the next step. 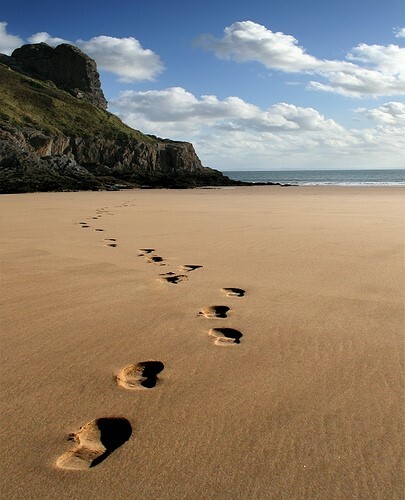 God says He will direct my steps…no matter my plans. I’m starting my day thinking of only today…it might not last more than an hour, but it’s the way I’m going to try to start it. I’m going to focus on the tasks before me and not worry about the ones waaaaayyy before me. Just what’s in front of me. That’s all I need to worry about…actually I don’t even need to worry, just walk. Big picture planning or little picture planning, I trust that God will lead me one step at a time. Lord, thank you for today…for another day with You. Even though it is my plan to just take one step at a time today, I know I will struggle with wanting more. Wanting to see the whole path laid out before me. Father, I know that I can trust you with everything. I just sometimes really want to know…actually I always really want to know….where I’m going, what I need to do, how am I going to get there, how I can help you…as if you need my help. Lord, I just really want to be in your will and I really want life to make more sense. Please comfort me with your presence, bless me with your wisdom, and uphold me with your strength. This path is exhausting. Father, I trust that You have a plan and it is good. I trust that you love me. I trust that you will never leave me. You have always been faithful to me. Thank you. In Jesus name I pray, Amen. Next Article Had You Known? Thank you, Sue!!! I needed to read the title alone today.